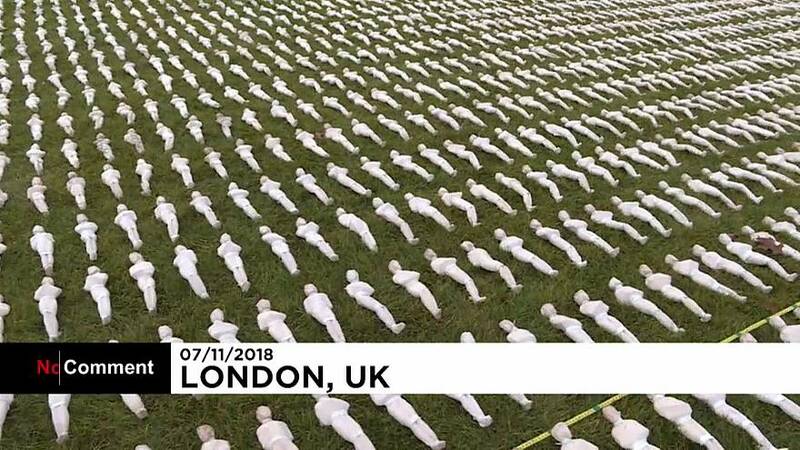 A British artist has unveiled an installation composed of more than 70,000 shrouded figures to mark the centenary of the end of World War One. The "Shrouds of the Somme" installation is a collection of 72,396 small figurines laid out in London's Queen Elizabeth Olympic Park. Each one represents a British Commonwealth serviceman who was killed at the Somme and has no known grave. The Battle of the Somme is one of the bloodiest battles in history. The devastating World War One clash began on July 1, 1916, along a 24-kilometre front near the River Somme in northern France, where British and French forces hoped to win a decisive victory against Germany. Around 20,000 British soldiers died on the first day alone. By the end of the battle in November more than one million men had perished and the allies had advanced just 11 kilometres.